backyard—I can see how things are lost. tree rings are dead things. 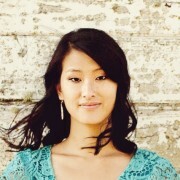 Julie Feng is originally from Taipei, Taiwan. She now lives, works, and teaches in Seattle. She is the recipient of the Joan Grayston Poetry Prize, the Arthur Oberg Prize for Poetry, and the Academy of American Poets Award.